How Much Money Can You Earn From Watching Videos On Smores Via PrizeRebel? How much money can you earn watching videos at Smores via PrizeRebel? It’s possible to get paid for having videos running on your computer screen, but is it worth it? The best way I’ve found is via videos. It doesn’t pay huge amounts but is proving worthwhile. Today I decided to run a little test and here I review the results. Here is the process you need to go through to do the same. First create an account at PrizeRebel. Add your Paypal account email to your ‘Account Info’ section in PrizeRebel. 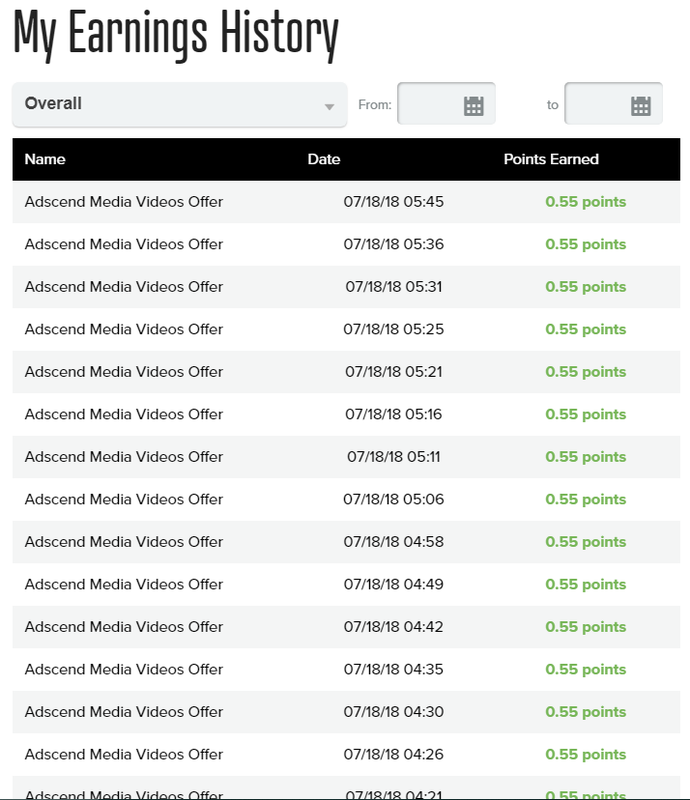 Navigate to ‘Video Wall’ section under the ‘Earn’ menu link. Pick one of the Smores.tv categories, such as; food, lifestyle, music, or nature. Click on the green button to open the videos webpage. Now leave it running for as long as you want to earn for. Now you know how to do it, let’s look more into the actual cash money situation! How Much Money Will You Make Running These Videos? I’ve been trying this for a couple of month’s now and what I’ve learned is that the profit from doing this will vary quite a bit. Unfortunately, that means there is no one set figure to give you. Whether the income variation is down to the number of advertisements in the system or what the reason is I’m not too sure. I suspect there are varying factors. On my lunch break today I decided to run the videos as a profit test for this blog post and here is a screenshot of the credits being applied to my account. 1 point at PrizeRebel is worth 1 cent. The minimum cashout is $5, they have lots of other ways for you to make money, this is just one of them. For this article let’s focus purely on the videos. Here is the screenshot of money made from the videos in this test. To briefly sum it up: As you’d expect this isn’t a lot of money. But there is literally no effort so that’s probably what’s to be expected. We live in a society where a lot of people seem to want decent money handed to them on a plate for no work. That’s not going to happen. The fact that this is even possible is great! In the case of today the videos helped me get over the payout threshold for PrizeRebel (who pay almost instantly, it normally takes about 10 minutes for the dollars to hit your Paypal account, it’s one of the lowest threshold sites). The maths, in this case, works out that you would get around 6 cents per hour. So even if you left a computer running 24 hours a day in a 30 day month that equals $43.20. It’s actually a lot higher than I would have expected personally! Of course, in practice I don’t think it would come out this higher, I imagine there would be a limit on how many times you can see an ad or something like that. You must have the videos page open as the main browser page on your screen. If you use Google Chrome like me and open another tab it will pause the videos. Obviously, this won’t matter if you are leaving the machine running anyway while not sitting in front of it. If you do want to do this but also still be using your computer then you still can. For example, I wrote this blog post while still having the videos running in the background to notch up even more credits today. If you have the web browser active on your screen but then another program windowed the videos will still run. If you need to use the internet still then you could run the videos on your main browser, say Google Chrome, being full-screened, and then use Mozilla Firefox but have it windowed not full-screen. The Smores website will automatically switch the videos you’re seeing to another category if the category you’ve picked runs out of videos to show you. This means you don’t have to worry about leaving it for a long-time, the videos should still play. Here is how it should look. Check your PC settings for how many minutes it’s set until it goes into ‘sleep’ mode. You will want to set these really high to reduce the risk of your computer deciding to show the screensaver if you leave the screen for a long time. Be aware that variance is inevitable. Somedays you can earn a lot more than others. I’ve also had problems in the past where my internet would drop off and it would cause a video to show a loading icon but then never actually load even though the internet had come back online. These sort of little niggles are inevitable, accept it and you won’t be too annoyed when the odd issue occurs. If you’ve got more unanswered questions about PrizeRebel, see if the forum area can help. This is an easy way to add a few extra dollars over time to your bank account. If you’re not yet a PrizeRebel member then go now and join up and try it out for yourself. Realistically this sort of thing is obviously not ever going to pay large amounts, why would it, we aren’t actually doing anything, effectively just being given money! Which is fine by me. At PrizeRebel they have other ways to earn as well, the main one being surveys, so using this videos opportunity should just be a small part of your cash building efforts. For one week starting from today (the day of this comment), the amount you can earn has increased from 0.55 to 0.82. In percentage terms this equals a lot more profit. Good to see that from time to time this sort of thing happens. Show’s it’s worth also keeping it in your arsenal of money-making methods for when the bonuses are around, even if you don’t want to do it all the time.